I am pleased to inform you that your blog, “Becoming a Stepmom,” has been selected for RemarriageWorks.com’s first annual Top 10 Remarriage & Stepfamily Blogs List, recognizing your outstanding blog for the year 2010. Our staff reviewed nearly 100 blogs about remarriage and stepfamily life, and determined that your blog is the best. To be selected for our Top 10 Blogger List for 2010, we chose blogs that are the most informative, supportive, and inspiring for millions of remarried and stepfamilies, including our RemarriageWorks.com audience. 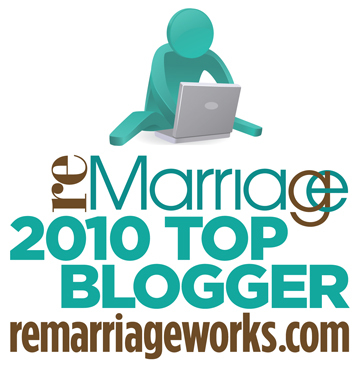 In our newly published article, “Top 10 Remarriage & Stepfamily Blogs for 2010,” featured on www.RemarriageWorks.com, we announce our top 10 list along with our quick assesement and rundown of what excites us most about your blog. On behalf of millions of remarrieds and RemarriageWorks.com, thank you for producing your blog. I personally think it helps remarriages and stepfamilies succeed. WOW!!!! Thank you so much to Paula and her team. Another big thank you to all of my readers and to the listeners of my Stepmom Circles Podcasts. A HUGE thank you to my stepmom coaching clients. You inspire me every day with your courage and great big hearts. And of course, my husband, stepkids, and daughter deserve a big shout-out for giving me the inspiration to continue writing about stepfamily life and working with so many wonderful stepmoms all around the globe. This is the first Stepmom Circles Podcast of 2011! And my guest is a woman I have long admired: Dr. Harriet Lerner. She’s a clinical psychologist and the author of the classic book The Dance of Anger. If you don’t have this book on your shelf, you should. It is one of the most empowering books I’ve ever read about dealing with unhealthy patterns in relationships. Having constant fights with your partner? Read it. Engaged in a battle with the ex? Read it right now. Have an idea for a future podcast? Shoot me an email at becomingastepmom (at) gmail (dot) com. How Do I Listen? Click on the links to the show above or visit HERE to browse all of the Stepmom Circles shows. You can listen to it online or download it the show to your mp3 player. It’s free. Enjoy! Are You Willing to Be the Bad Guy? You guys have probably heard the joke stepmothers whisper to each other about how we all have scars on our tongues from biting them so often, right? Let’s admit it: Sometimes we can’t keep our mouths shut. And what’s more, sometimes we shouldn‘t. As all things are in life and in stepfamilies, it’s a balancing act. Here are the criteria I try to use while helping to raise my three stepchildren, ages 15, 13, and 10. Am I willing to be the bad guy? Sometimes it’s impossible to consult your spouse or the ex before you speak. Sometimes women see things that men simply don’t. Sometimes you believe so strongly in something that you simply must speak. That’s life. So are you willing to be the bad guy? Because stepparents who speak up become targets for anger from the kids and exes and sometimes our spouses, too. If you are willing, then speak your truth. Sometimes truth is more important than getting along with everyone. Can I live with my choice to remain silent? I typically stepparent from the back seat as most stepfamily professionals advise. But sometimes I simply can’t because I feel that if I don’t speak up I will not be able to live with that choice. As you all know, a stepmother’s greatest skill is learning how to let things go. (Your stepchild was allowed to do something by her mother that you disagree with? Oh well. ) Only you know which values you can remain silent about and which ones you can’t. What are you concerned/angry about? A warning from someone who has been there: If you do speak up to a stepchild about a behavior or issue you feel strongly about, then work to keep it just about that one thing. For instance, if a stepchild sasses you in a nasty teen tone and you have had it up to here with the disrespect, keep your words calm and focused on the issue at hand. Because stepmothers often stuff so many things to keep the peace, if you open your mouth, your response can be totally out of proportion to the issue because you’re bundling all your feelings of anger from past hurts and injustices into the current issue. If you can’t keep calm and blow your lid instead, try to have a conversation after everyone has cooled off to talk about why you reacted the way you did. If I stuff my feelings will I carry this with me forever? I want my stepchildren to like me. Sure, I do. But I also don’t want to have a heart attack any time soon. (Ever read the book Anger Kills? Scary!!) I’m only willing to stuff so much to make the peace. If I am not myself then I have done my entire family a disservice. I wrote my book A Career Girl’s Guide to Becoming a Stepmom because I did an interview with a veteran stepmother for an article I was working on. She’d been in her stepfamily for more than two decades. After I asked her a few questions, she let go a torrent of anger she’d been holding in and building on for a quarter of a century!! If you choose to remain silent, please, please, please, do not carry that anger with you for the rest of your life. So. Are you willing to be the bad guy? About what issues? There are stretches of time in which I notice every little thing my husband does wrong. Know what I mean? My eyes see that he has dropped his clean clothes in a pile beside the bed instead of how hot he looks in his new sweater. I see that he has left the shovels out on the front porch instead of noticing how he pulled me in for a hug while we made dinner. I begin collecting evidence about how MUCH I do and how LITTLE he does to support our household. Does this sound familiar to you? Not a great way to build a strong partnership. So how about if we collect evidence that our partners LOVE us and focus on that instead? Take a moment and write down all the evidence that your partner loves you. Write down all the ways in which you’re perfect for each other and the ways he supports you. Make a list of all the activities you love doing together or those small moments you spend together that you love the most. Laminate the list and pull it out when you want to feel more lightness and love in your relationship. I am working to get all of the old shows up. Plus I have some exciting new ones coming soon. You can listen to the shows online or download the mp3 files to listen to on your iPod or mp3 player. You can also download them to your mobile device. If you have a favorite show, you can post it on your blog to share with others. Soon I’ll have the show back up on iTunes as well. Thanks for your patience! Have a topic you want to hear about? Leave a comment or send me a note at becomingastepmom (at) gmail (dot) com.